Leder du efter den unikke måde at lave nogle fantastiske minder med en kærlighed til? Oliver Creek i ørkenen på 4 hektar er stedet. Nyanpasset indbygget med genvundet staldtræ bringer den gamle til ny igen. Denne søde specialbyggede hytte har en kingsize-seng, flisebadekar med stor bruseniche, fuldt udstyret køkken, pejs med pejs, indgang til verandaen, hvor du kan nyde lyden fra Oliver Creeks rushende vand eller sidde ved bæken og lade stresset smelte væk. Træd ud af din dør og gå ind i Rich Mountain Wilderness - over 13.000 acres for dig at opdage. Eller bare læne dig tilbage og nyd alle de luksuskabiner i kabinen selv - og glem ikke om blødning i boblebadet! Talrige vandrestier i nærheden - AT og BMT er de mest kendte. Ejeren giver detaljerede oplysninger om områdets aktiviteter, herunder vandrestier. This place was the most relaxing retreat! Our first morning here, we woke up to four deer in the driveway. It was quit rewarding being able to watch them travel by from the picturesque window views. We spent the majority of our time lounging between the hot tub and the fireplace, never wanting to leave. Our only venture away from the cabin was to Long Creek Falls, which is well worth the drive and short hike. We are so grateful to have found this little slice of Heaven and can’t wait to come back (with a hammock for the creek)! Just a perfect piece of isolation. We enjoyed every second of our mini getaway. The property is great with the trail and Creek. Everything exceeded our expectations. Molly you were awesome too! Thanks so much, we will be back! Beautiful cabin in a peaceful and secluded area. Loved the screened porch and hot tub area. 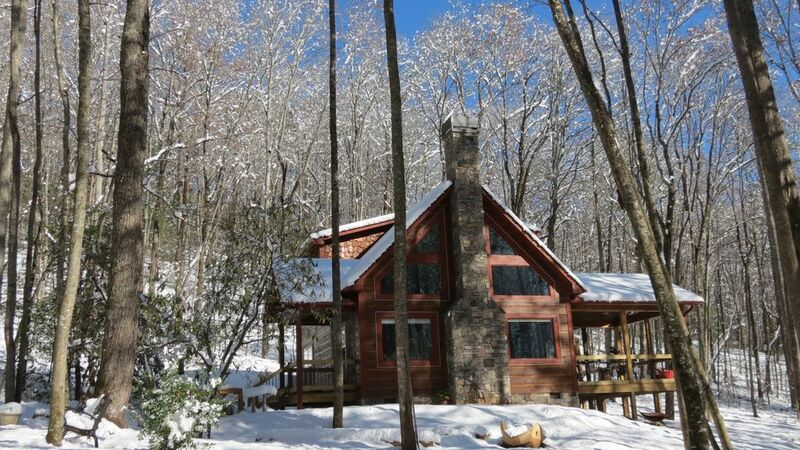 Everything you need is here at this wonderful cabin. Be sure and get groceries before you get there as cabin is not close to a store. Beautiful wooded area and stream. Would recommend for a private, peaceful get away. Loved staying at Molly’s cabin. Very beautiful and a quiet place to get away. A wonderful space. Located in near seclusion, decorated sublimely, this is the perfect place for relaxation and reconnection. A truly exceptional time spent. Thank you Molly. Property was very clean and very well decorated.